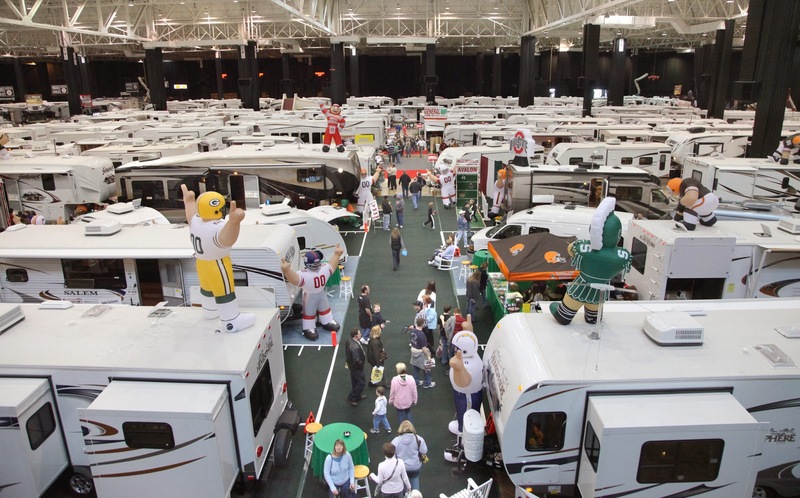 Each year we make the pilgrimage to an RV show, mainly the Cleveland RV Super Show which is held the second week of January. It comes along at the perfect time, almost the mid point of winter and as cabin fever is just starting to set in. 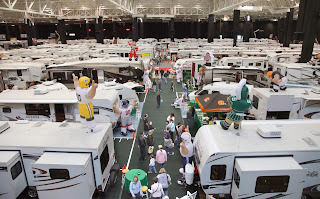 You can really tell how the industry is doing by the number of RV's the dealers bring as well as the attendance. I am thinking 2014 is going to be a big year. The place was packed with more people and RV's than I have seen in the past 13 years we have attended. The show for us has never been about looking for that perfect new RV. Although I will admit, it probably has gotten the "I need a new RV" itch started. But more times than not we meet friends who may have that itch and help pursued them that they need a new RV for the upcoming season. With the increase in RV's to look at we have noticed fewer and fewer aftermarket RV product suppliers at the show. I am thinking that most people don't want to carry around that new camping chair or they figure they can find it cheaper online. RVupgrades does not attend the shows at this time because we see more value in improving our online store, warehouse facility, products offered and stock levels. The thing I think about most at the RV show is all of the "new to RV'ing" buyers who get caught up with the interior layout and pretty couch colors and never even look into the structural aspects of the RV. From ill handling motorhomes to inadequate tow vehicles new buyers are many times in for a rude awakening when they leave the dealership with that new RV. I know because I was once one of those new buyers. I think most newbies associate RV's to cars and feel that they will be able to drive or tow their new RV off the lot and not come back for service for many years. And that a motorhome will handle like Mom's minivan and a trailer only requires a hitch on the back of SUV or truck to tow safely. It was funny, we spotted the salesperson who had sold us a Class C motorhome a few years back and I told him how bad it handled and how we got tossed around on a trip out west. He said "oh yeah those class C's are terrible to drive, I would have never done that trip in one." Of course he would have never said that while we where purchasing it, but he knew it. It almost surprises me why the whole industry hasn't folded with so many disillusioned RV buyers. The only thing I can think of is that the hobby is so great that many overcome that initial shock of new RV ownership and learn to repair, maintain and improve their RV so it can be used as it was intended. I know that was my experience. The above is one of the many reasons to buy and Airstream. We have been pulling a 1965 Caravel for nearly 20 years and have loved every minute. Also many people want to take a full size home with them. Our little 17 ft. is ideal and people need to consider smaller.